In 1925, inventor Boris Aivaz patented the process of making a cigarette filter from crepe paper, with some variants including cellulose wadding. Aivaz produced the first cigarette filter from 1927 in, but uptake was low due to a lack of the machinery required to produce cigarettes with the filtered tip. From 1935, a British company began to develop a machine that made cigarettes incorporating the tipped filter. It was considered a specialty item until 1954, when manufacturers introduced the machine more broadly, following a spate of speculative announcements from doctors and researchers concerning a possible link between lung disease and smoking. Since filtered cigarettes were considered “safer”, by the 1960s, they dominated the market. The raw material for the manufacture of cigarette filters is cellulose (obtained from wood). The cellulose is acetylated (i.e. making it into a material called cellulose acetate or simply “acetate” for short), dissolved, and spun as continuous synthetic fibers arranged into a bundle called tow. The cellulose is a substituted diacetate (actually 2.35 – 2.55 substitution range) cellulose, due to its chemical and physical processing. This tow is opened, plasticized, shaped, and cut to length to act as a filter. In the early 1950s, Kent brand cigarettes used crocidolite asbestos as part of the (Micronite) filter. Asbestos fiber is heatproof, insoluble and forms extremely fine fibers — but has been proven to cause lung cancer when inhaled. Other filter variations include Lark cigarettes, which featured a chamber filled with activated charcoal granules. In light cigarettes and some full flavor cigarettes, the filter is perforated with tiny holes that dilute the smoke with air. As such, the inhaled smoke contains less tar and nicotine. In theory, this should make the cigarette “safer” than full flavor ones. In practice, however, the average smoker compensates by inhaling more deeply or by covering parts of the holes with fingers or lips. Because of this, smokers of light cigarettes can be exposed to equal or greater doses of carcinogens and tar than they would be with medium tar cigarettes. 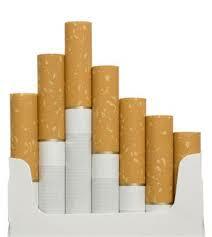 Most cigarette filters are made from cellulose acetate. Depending on conditions, estimates for the time taken for them to degrade range from 1 month – 3 years or to 10–15 years. This resistance to biodegrading is a factor in littering, environmental damage and suggested lung damage. In the 2006 International Coastal Cleanup, the number of individual cigarettes and cigarette butts collected amounted to 24.7% of the total number of garbage items collected, over twice as many items as any other category.